State of India, within the Madras Presidency. 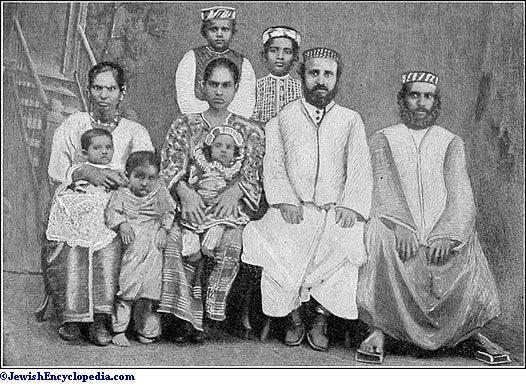 The Jews in Cochin numbered 1,142 in 1891, and are divided into two classes: the Whites, whose complexion is almost as fair as that of European Jews, and the Blacks, who, though darker than the former, are not so black as negroes, and are of the same complexion as the Jews of Yemen or Kurdistan. 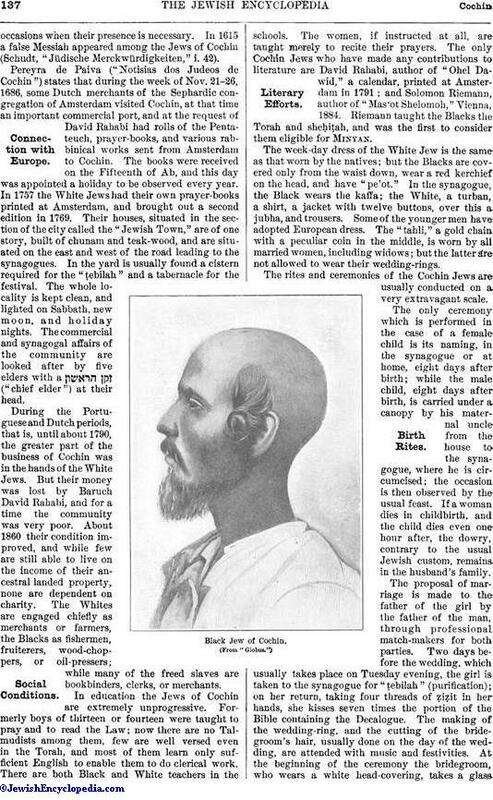 The White Jews number at present about fifty families, and these are divided into six stocks: the Zakkai, who are the oldest, and are said to have come from Cranganore in 1219; the Castillia, exiles from Spain in 1492, who arrived at Cochin in 1511; the Ashkenazi and Rothenburg, who came from Germany in the sixteenth century; and the Rahabi and Haligua families, who came from Aleppo about 1680. There are three hundred families of the Blacks. The earliest trace of the Cochin Jews is to be found in two bronze tablets known as the "Sâsanam" (Burnell, "Indian Antiquary," iii. 333-334), which are now in the possession of one of the elders and contain a charter given by Cheramal Perumal, King of Malabar, to Isuppu Irabbân (Joseph Rabban), probably a Jew of Yemen who led an expedition of Jews to Cranganore about the year 750. By the terms of the charter, engraved in Vaṭṭeluttu characters on the plate, Rabban, who is referred to as the prince of Ansuvannam, was granted seventy-two "free houses" and feudal rights in Ansuvannam, near Cranganore. The date of the charter can be fixed at about 750; it can not, for paleographical reasons, have been much earlier than this, nor later than 774, since a grant made to the Nestorian Christians at that time was copied from it. (From a photograph. )Traces in Middle Ages. 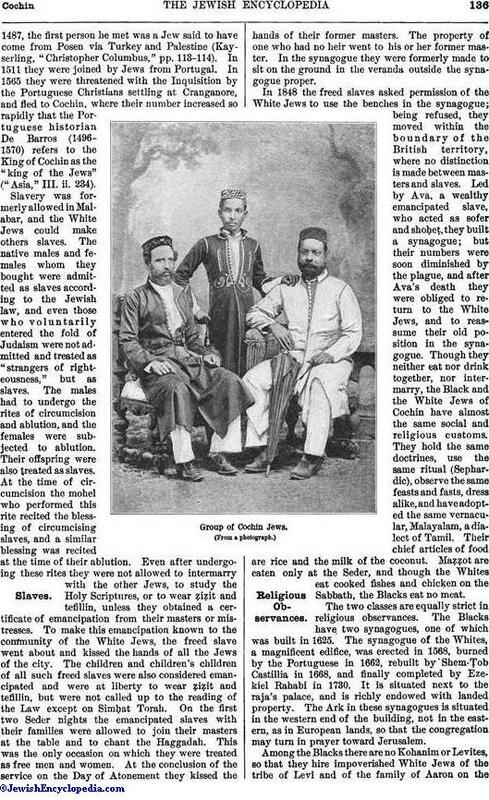 These Jews intermingling with the natives became the progenitors of the Black Jews of Cochin. These are mentioned by Ibn Wahab in the ninth century; and Benjamin of Tudela appears to have visited or heard of them about 1167. He reports that they were one hundred in number and as black as the rest of the inhabitants of Coilum or Quilon, then the most important port on the Malabar coast. There Marco Polo found them a century later ("Travels of Sir Marco Polo," ed. Yule, ii. 263), and when Vasco da Gama reached Calicut in1487, the first person he met was a Jew said to have come from Posen via Turkey and Palestine (Kayserling, "Christopher Columbus," pp. 113-114). In 1511 they were joined by Jews from Portugal. In 1565 they were threatened with the Inquisition by the Portuguese Christians settling at Cranganore, and fled to Cochin, where their number increased so rapidly that the Portuguese historian De Barros (1496-1570) refers to the King of Cochin as the "king of the Jews" ("Asia," III. ii. 234). Slavery was formerly allowed in Malabar, and the White Jews could make others slaves. The native males and females whom they bought were admitted as slaves according to the Jewish law, and even those who voluntarily entered the fold of Judaism were not admitted and treated as "strangers of righteousness," but as slaves. The males had to undergo the rites of circumcision and ablution, and the females were subjected to ablution. Their offspring were also treated as slaves. At the time of circumcision the mohel who performed this rite recited the blessing of circumcising slaves, and a similar blessing was recited at the time of their ablution. Even after undergoing these rites they were not allowed to intermarry with the other Jews, to study the Holy Scriptures, or to wear ẓiẓit and tefillin, unless they obtained a certificate of emancipation from their masters or mistresses. To make this emancipation known to the community of the White Jews, the freed slave went about and kissed the hands of all the Jews of the city. The children and children's children of all such freed slaves were also considered emancipated and were at liberty to wear ẓiẓit and tefillin, but were not called up to the reading of the Law except on Simḥat Torah. On the first two Seder nights the emancipated slaves with their families were allowed to join their masters at the table and to chant the Haggadah. This was the only occasion on which they were treated as free men and women. At the conclusion of the service on the Day of Atonement they kissed the hands of their former masters. The property of one who had no heir went to his or her former master. In the synagogue they were formerly made to sit on the ground in the veranda outside the synagogue proper. In 1848 the freed slaves asked permission of the White Jews to use the benches in the synagogue; being refused, they moved within the boundary of the British territory, where no distinction is made between masters and slaves. Led by Ava, a wealthy emancipated slave, who acted as sofer and shoḥeṭ, they built a synagogue; but their numbers were soon diminished by the plague, and after Ava's death they were obliged to return to the White Jews, and to reassume their old position in the synagogue. 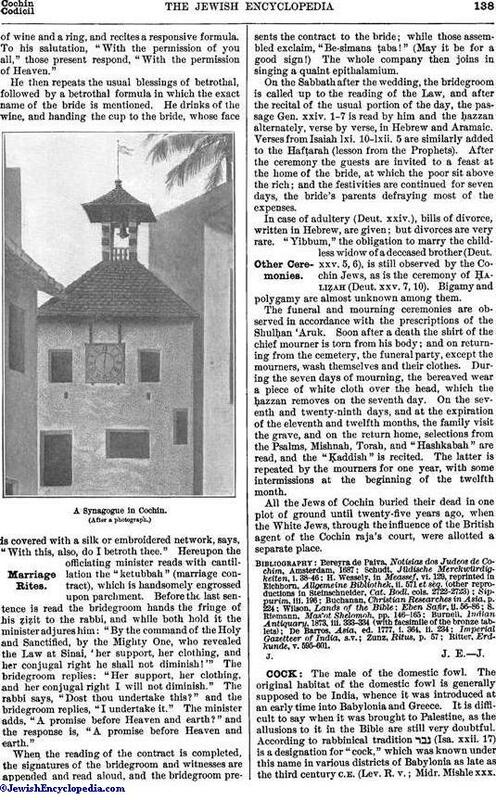 Though they neither eat nor drink together, nor intermarry, the Black and the White Jews of Cochin have almost the same social and religious customs. They hold the same doctrines, use the same ritual (Sephardic), observe the same feasts and fasts, dress alike, and have adopted the same vernacular, Malayalam, a dialect of Tamil. Their chief articles of food are rice and the milk of the coconut. Maẓẓot are eaten only at the Seder, and though the Whites eat cooked fishes and chicken on the Sabbath, the Blacks eat no meat. The two classes are equally strict in religious observances. 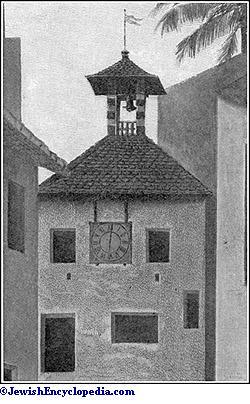 The Blacks have two synagogues, one of which was built in 1625. The synagogue of the Whites, a magnificent edifice, was erected in 1568, burned by the Portuguese in 1662, rebuilt by Shem-Ṭob Castillia in 1668, and finally completed by Ezekiel Rahabi in 1730. It is situated next to the raja's palace, and is richly endowed with landed property. The Ark in these synagogues is situated in the western end of the building, not in the eastern, as in European lands, so that the congregation may turn in prayer toward Jerusalem. Among the Blacks there are no Kohanim or Levites, so that they hire impoverished White Jews of the tribe of Levi and of the family of Aaron on theoccasions when their presence is necessary. In 1615 a false Messiah appeared among the Jews of Cochin (Schudt, "Jüdische Merekwürdigkeiten," i. 42). Pereyra de Paiva ("Notisias dos Judeos de Cochin") states that during the week of Nov. 21-26, 1686, some Dutch merchants of the Sephardic congregation of Amsterdam visited Cochin, at that time an important commercial port, and at the request of David Rahabi had rolls of the Pentateuch, prayer-books, and various rabbinical works sent from Amsterdam to Cochin. The books were received on the Fifteenth of Ab, and this day was appointed a holiday to be observed every year. In 1757 the White Jews had their own prayer-books printed at Amsterdam, and brought out a second edition in 1769. Their houses, situated in the section of the city called the "Jewish Town," are of one story, built of chunam and teak-wood, and are situated on the east and west of the road leading to the synagogues. In the yard is usually found a cistern required for the "ṭebilah" and a tabernacle for the festival. The whole locality is kept clean, and lighted on Sabbath, new moon, and holiday nights. The commercial and synagogal affairs of the community are looked after by five elders with a ("chief elder") at their head. During the Portuguese and Dutch periods, that is, until about 1790, the greater part of the business of Cochin was in the hands of the White Jews. But their money was lost by Baruch David Rahabi, and for a time the community was very poor. About 1860 their condition improved, and while few are still able to live on the income of their ancestral landed property, none are dependent on charity. The Whites are engaged chiefly as merchants or farmers, the Blacks as fishermen, fruiterers, wood-choppers, or oil-pressers; while many of the freed slaves are bookbinders, clerks, or merchants. In education the Jews of Cochin are extremely unprogressive. Formerly boys of thirteen or fourteen were taught to pray and to read the Law; now there are no Talmudists among them, few are well versed even in the Torah, and most of them learn only sufficient English to enable them to do clerical work. There are both Black and White teachers in the schools. The women, if instructed at all, are taught merely to recite their prayers. 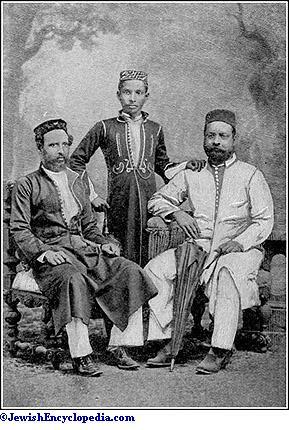 The only Cochin Jews who have made any contributions to literature are David Rahabi, author of "Ohel Dawid," a calendar, printed at Amsterdam in 1791; and Solomon Riemann, author of "Mas'ot Shelomoh," Vienna, 1884. Riemann taught the Blacks the Torah and sheḥiṭah, and was the first to consider them eligible for Minyan. 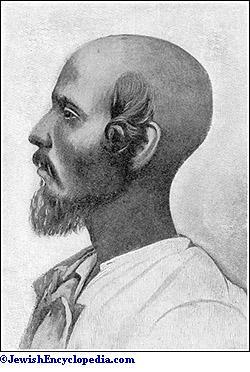 The week-day dress of the White Jew is the same as that worn by the natives; but the Blacks are covered only from the waist down, wear a red kerchief on the head, and have "pe'ot." In the synagogue, the Black wears the kaffa; the White, a turban, a shirt, a jacket with twelve buttons, over this a jubha, and trousers. Some of the younger men have adopted European dress. The "tahli," a gold chain with a peculiar coin in the middle, is worn by all married women, including widows; but the latter are not allowed to wear their wedding-rings. The rites and ceremonies of the Cochin Jews are usually conducted on a very extravagant scale. The only ceremony which is performed in the case of a female child is its naming, in the synagogue or at home, eight days after birth; while the male child, eight days after birth, is carried under a canopy by his maternal uncle from the house to the synagogue, where he is circumcised; the occasion is then observed by the usual feast. If a woman dies in childbirth, and the child dies even one hour after, the dowry, contrary to the usual Jewish custom, remains in the husband's family. The proposal of marriage is made to the father of the girl by the father of the man, through professional match-makers for both parties. Two days before the wedding which usually takes place on Tuesday evening, the girl is taken to the synagogue for "ṭebilah" (purification); on her return, taking four threads of ẓiẓit in her hands, she kisses seven times the portion of the Bible containing the Decalogue. The making of the wedding-ring, and the cutting of the bridegroom's hair, usually done on the day of the wedding, are attended with music and festivities. At the beginning of the ceremony the bridegroom, who wears a white head-covering, takes a glassof wine and a ring, and recites a responsive formula. To his salutation, "With the permission of you all," those present respond, "With the permission of Heaven." He then repeats the usual blessings of betrothal, followed by a betrothal formula in which the exact name of the bride is mentioned. He drinks of the wine, and handing the cup to the bride, whose face is covered with a silk or embroidered network, says, "With this, also, do I betroth thee." Hereupon the officiating minister reads with cantillation the "ketubbah" (marriage contract), which is handsomely engrossed upon parchment. Before the last sentence is read the bridegroom hands the fringe of his ẓiẓit to the rabbi, and while both hold it the minister adjures him: "By the command of the Holy and Sanctified, by the Mighty One, who revealed the Law at Sinai, 'her support, her clothing, and her conjugal right he shall not diminish!'" The bridegroom replies: "Her support, her clothing, and her conjugal right I will not diminish." The rabbi says, "Dost thou undertake this?" and the bridegroom replies, "I undertake it." The minister adds, "A promise before Heaven and earth?" and the response is, "A promise before Heaven and earth." When the reading of the contract is completed, the signatures of the bridegroom and witnesses are appended and read aloud, and the bridegroom presents the contract to the bride; while those assembled exclaim, "Be-simana ṭaba!" (May it be for a good sign!) The whole company then joins in singing a quaint epithalamium. On the Sabbath after the wedding, the bridegroom is called up to the reading of the Law, and after the recital of the usual portion of the day, the passage Gen. xxiv. 1-7 is read by him and the ḥazzan alternately, verse by verse, in Hebrew and Aramaic. Verses from Isaiah lxi. 10-lxii. 5 are similarly added to the Hafṭarah (lesson from the Prophets). After the ceremony the guests are invited to a feast at the home of the bride, at which the poor sit above the rich; and the festivities are continued for seven days, the bride's parents defraying most of the expenses. In case of adultery (Deut. xxiv. ), bills of divorce, written in Hebrew, are given; but divorces are very rare. "Yibbum," the obligation to marry the childless widow of a deceased brother (Deut. xxv. 5, 6), is still observed by the Cochin Jews, as is the ceremony of Ḥaliẓah (Deut.xxv. 7, 10). Bigamy and polygamy are almost unknown among them. The funeral and mourning ceremonies are observed in accordance with the prescriptions of the Shullḥan 'Aruk. Soon after a death the shirt of the chief mourner is torn from his body; and on returning from the cemetery, the funeral party, except the mourners, wash themselves and their clothes. During the seven days of mourning, the bereaved wear a piece of white cloth over the head, which the ḥazzan removes on the seventh day. On the seventh and twenty-ninth days, and at the expiration of the eleventh and twelfth months, the family visit the grave, and on the return home, selections from the Psalms, Mishnah, Torah, and "Hashkabah" are read, and the "Ḳaddish" is recited. The latter is repeated by the mourners for one year, with some intermissions at the beginning of the twelfth month. 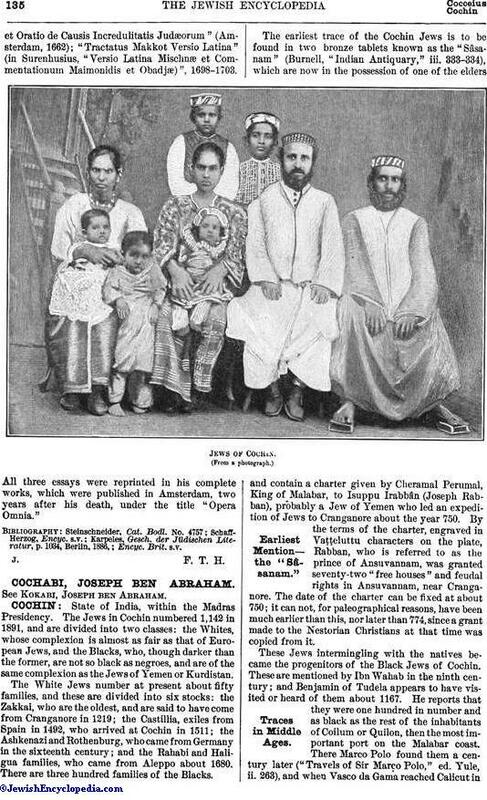 All the Jews of Cochin buried their dead in one plot of ground until twenty-five years ago, when the White Jews, through the influence of the British agent of the Cochin raja's court, were allotted a separate place.